Start bargain hunting for the party decorations from August. Hit the stores near your place. Stores start selling Halloween decorations right from the first week of August. Mostly all the items have a price that is as low as 1$. You will also get ample variety. You may get plastic Halloween goblets or serving dishes. Or even spider-themed plates. And then, you wouldn’t like to miss the Halloween candles that resemble Jack-o-Lanterns and skulls. 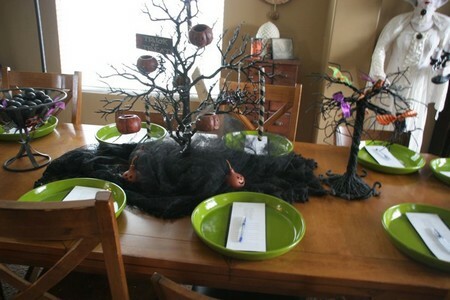 These all would certainly add so much charm to your Halloween party table. Put up loads of artificial spider webs. They will be the freakiest decoration that you put on your house. These are also relatively cheaper. Some shops may offer these stretchable webs at a price as low as $2. Also, these webs are available in packages that make them convenient. Which means that you may be able to cover a very big portion of the whole house. You may want some for the doorways as well as the shelving. These would provide just the perfect eerie atmosphere to your party. Keep in mind the Halloween “creepy crawlers”. Lay your hands on a couple of plastic spiders or bugs. In the local stores, you will get these in packages. These mostly cost within 5$. For those “extra effects” you may put these plastic spiders in the webs. At the same time, plastic bugs laying scattered on the dinner table will be a sure-shot eye catcher. Add charm to your table. Your table should be the center of attraction. Decorate it s well that your guests will be nothing but bound to be impressed. Start with covering the whole table with an aluminum foil to give it a shimmering look. Go and get a couple of goblets. Fill them with some candy corn. If you have a tea light candle, go ahead and put it on the table as well. Having done this, now work on the treats as well as drinks. Scatter them throughout the table. If your table has some empty spaces left still, go ahead and put your candle decorations there. When the table is done, do not forget your spooky treats. And of course there are spider cupcakes as well as fizzy drinks that are blood red in color. These are just perfect if you have a tight budget. These may cost you within 1$ if you arrange for hefty servings. Serve them in big buckets. Put smoky dry ice inside the buckets for the scary, spooky Halloween effect. Dry ice is easy available in departmental stores and are usually placed next to the checkout lines.